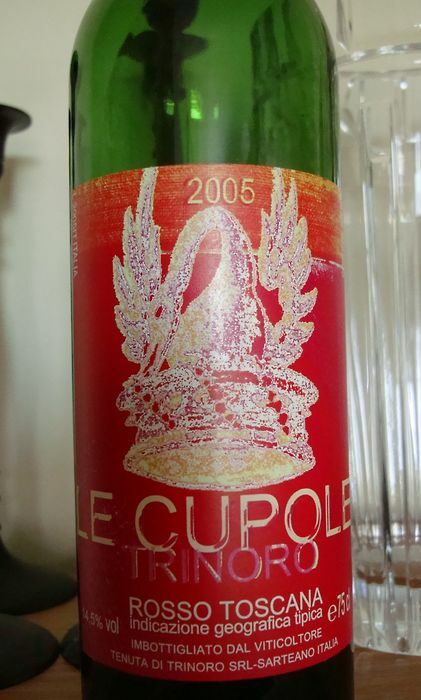 Tasting the 2005 Le Cupole Trinoro was, as they say in the deep North of Italy, Multo Benissimissimo! Medium ruby in color. Smooth, supple nose of dried currants and plums. Lovely, velvety mouth feel, with sweet, dark, concentrated notes of baked stone fruit and caramel. Gentle, refined tannins, with a moderate, modern finish. Became sweeter and even more caramelly over the course of two hours. A terrific mid-grade wine, a poster child Super Tuscan. International-style and ready to drink now, but also true to its Italian roots, with plenty of structure. A lot of versatility too: this could flatter a pasta or meat dish, but it could step up and be the star as well. Easy to drink, but wine nerds will love it too. My take: Medium to mid-sized ruby-red-indigo. Dried apricots, blackberry, blueberry, boysenberry, strawberry, carbon monoxide currants and figish datish plumsimmon (cross between plum and persimmon). Lovely, velvety, liquidy mouth feel, with sweet&sour, darkish grey concentrated notes of baked stones, shoelaces, down, iron railings, chewed gum, french vocabulary, paperweight, fruit and vanilla-caramel. Gentile, refined tannins, with a moderate, modern afterthought such as: Did I forget to pay my student loans again this month? Equally impressive bouquet that inspired a new Neil Diamond.